It was a pleasure to join you at the North Carolina Foot & Ankle Society’s Winter Scientific Seminar in Greensboro January 28th-30th. Allied introduced the new OrthoSleeve product line from ing Source, Inc. We were happy to have Mr. Dave Higgins, President and CEO of ing Source, Inc. join us. Ing Source, Inc. is located in Hickory, NC and are the inventors of the popular OrthoSleeve brand of medical and performance products. We are excited about our partnership and the bright future ahead. The FS6 Plantar Fascia Foot Sleeve is the perfect compliment to foot orthotic therapy. It is a 6 zone compression sock for Plantar Fasciitis, Achilles Tendonitis, Ankle Instability, Posterior Tibial Tendonitis and Sever’s Disease. In addition, the Foot Gym Pro is an all-in-one tool for performing foot and ankle strengthening and rehab exercises. These new products were very well received. Allied held a drawing for the Foot Gym Pro and the 12 pack Display Unit. Dr. John Moore won the Foot Gym Pro and Dr. Martha Aijouny won the 12-Pack display kit. 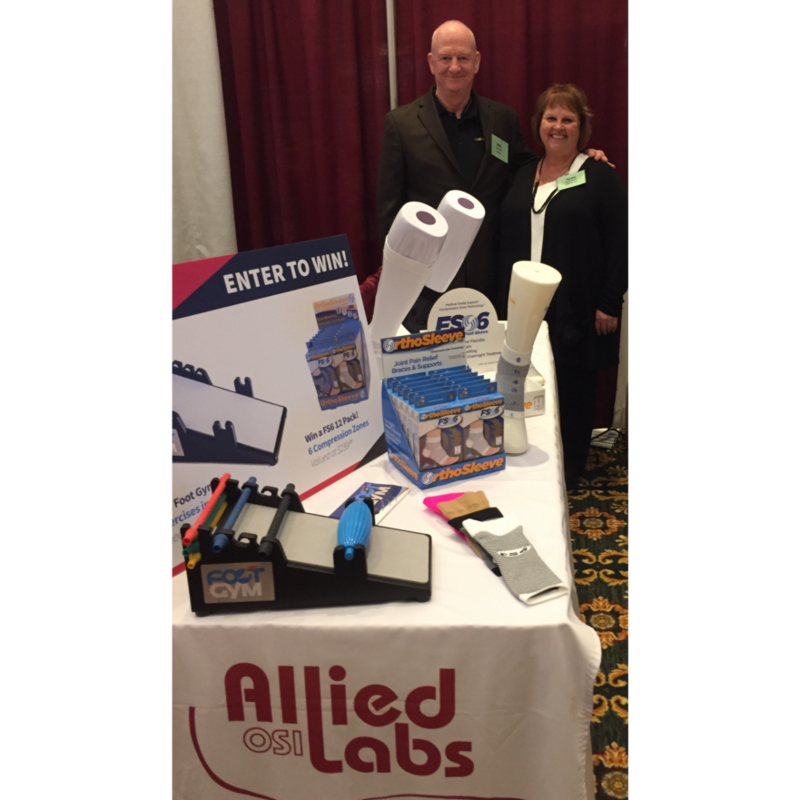 Allied OSI also displayed our entire product line including custom and OTC orthotics, Richie Braces®, DME and more! We heard a positive feedback about our dedicated Customer Service Team. Becky and Sheila’s expertise is invaluable! We look forward to seeing you next at the Midwest Podiatry Conference in Chicago.